LONDON — With the date and terms of Britain’s departure from the European Union mired in uncertainty, Parliament has seized control of the political process so lawmakers can try to hammer out a way forward. Meanwhile, Prime Minister Theresa May still hopes to win approval for her twice-rejected divorce deal with the bloc before an EU-imposed Friday deadline. With Brexit deadlocked amid feuding between Britain’s political factions, lawmakers voted to upend the usual parliamentary procedure, in which the government decides the schedule for debates and votes. The House of Commons carved out time for legislators to hold a series of “indicative votes” Wednesday on alternatives to May’s defeated deal. Lawmakers from across the political spectrum have submitted 16 different options for consideration, though Speaker John Bercow is expected to whittle the number down to about half a dozen before debate begins. The proposals include leaving the EU without a deal, remaining in the bloc’s single market and customs union, and holding a new referendum on Britain’s EU membership. The results are likely to be inconclusive, but could help indicate what, if anything, can command majority support in Parliament. Lawmakers behind the move plan to hold another day of votes next week to narrow down the proposals to one idea — then to send the government back to negotiate it with the EU. The government says Parliament’s move sets “a dangerous, unpredictable precedent,” but has promised to “engage constructively” with the result of the votes. But ministers say any plan agreed by Parliament must be “realistic” and negotiable with the EU. May hasn’t given up hope that the deal she agreed with the bloc setting out the terms of Britain’s withdrawal will be passed by Parliament, even though it has been rejected twice by hefty margins. Under an extension granted by the EU last week, if U.K. lawmakers approve the divorce deal by Friday — Britain’s original departure date — Britain will leave the EU on May 22. If they don’t, Britain has until April 12 to tell the EU what it plans to do next: leave without a deal, risking economic chaos, or seek a long delay to Brexit and chart a course toward a softer exit or even remaining in the bloc. 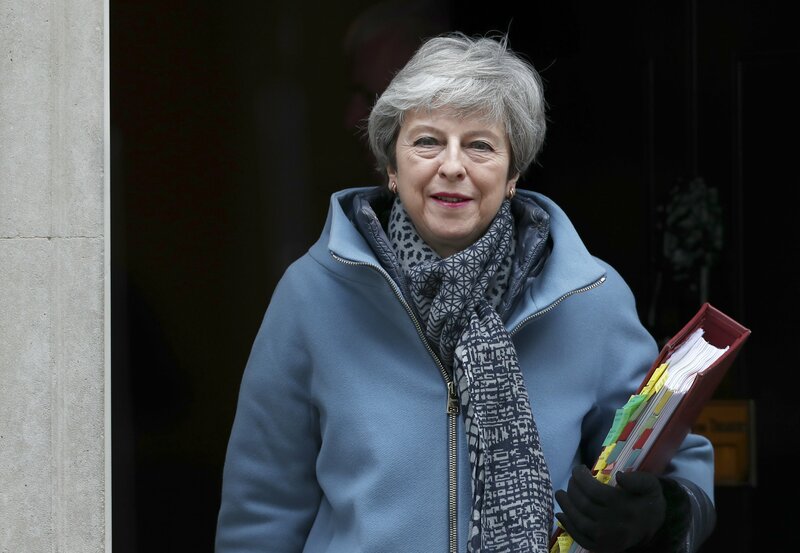 May is still holding talks with lawmakers and could try to hold a third vote on the deal on Thursday or Friday. She hopes to persuade pro-Brexit legislators who have previously opposed the deal that if they don’t support it, Parliament will either impose a softer Brexit or delay Britain’s departure from the bloc indefinitely. British politicians are divided over Brexit, but they agree that the process is a mess — and many blame May, who has refused to consider alternatives to her deal and failed to win changes to the agreement from the EU. Her authority has been shredded by a series of parliamentary defeats, and many Conservatives are now calling for May to step down. Some pro-Brexit Tories say they would support May’s deal if she promised to hand over the next stage of negotiations — when Britain and the EU will hammer out their future relations — to a new leader. For now, May is standing firm. Under Conservative rules, she can’t face a formal leadership challenge from within her own party until December because she survived one three months ago. But she is due to meet Conservative lawmakers later, and could try to win support for her deal by promising to step down at some point this year. And anti-Brexit campaigners haven’t abandoned the idea of a new Brexit referendum on remaining in the EU. There’s currently no majority for that in Parliament, but pro-referendum campaigners feel opinion is shifting in their favor. Hundreds of thousands of people marched through London on Saturday to demand a new Brexit vote. The “nuclear option” of simply canceling Brexit is also gaining support. An online petition urging the government to revoke the decision to leave the EU has amassed almost 6 million signatures.